Over the past couple of weeks, the Lexington-Fayette Urban County Government and the developers of CentrePointe have traded barbs over the direction of the perpetually-troubled $180 million retail, office, residential, and hotel project. 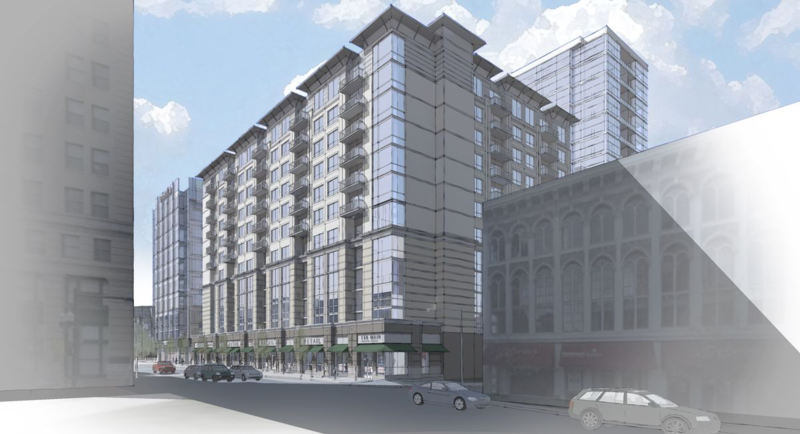 Citing a lack of work over the past 60 days, the city triggered a provision in their agreement with the developers which would require the developers to fill the gaping hole the project has left in the middle of downtown Lexington. The developers responded by claiming that the city was wrong – work had indeed been done on the site in the past 60 days. The developers then threatened to sue the city if they did not rescind the requirement to fill the hole. Late this week, a deal was struck between the city and the developers to postpone the confrontation. In a joint press release, the city and the developers claimed that a new, unnamed development partner has emerged. City officials expressed confidence in the new mystery partner’s ability to develop a project of CentrePointe’s magnitude. The new partner just needs 90 days to determine whether they will proceed. It probably won’t work out. The problem isn’t that we’ve heard all of this about CentrePointe before. Although we have. Mystery white-knight savior? Plenty of those. Promises to resolve everything, something, or anything in 30, 60, or 90 days? We’ve lost count. City officials positive about the financing? Yep. No, the real reason the new partner won’t proceed with CentrePointe is the lowliest, least exciting part of the project. CentrePointe is in trouble because no one will buy the publicly-financed bonds for its parking garage. Back when the Urban County Council approved the convoluted $30 million garage bond scheme in September 2014, I called the plan fraudulent. CentrePointe’s developers were planning to use the city’s good name to offer bonds which were virtually guaranteed to lose money for investors. There was even a strong possibility that investors would lose all of their money. If the developers were able to assemble a bond offering, it would have been fraudulent. But they haven’t proven competent enough to defraud investors. Yet. At that meeting last September, councilmembers were told that a bond offering statement could be prepared in the next week, and the bonds could be offered for sale in a month or two. That was eight months ago, and the bonds have yet to be issued. Roger Peterman, an attorney who consults with the city on bond issues, told the council that a bond underwriter had been retained who “assured us that there’s a market for these bonds.” In fact, the underwriter was so enthusiastic that they were interested in purchasing and reselling the bonds themselves (rather than simply identifying purchasers), which Peterman characterized as a “much stronger commitment”. So with all of this “enthusiasm” and “commitment”, why weren’t the developers able to issue the bonds? Why can’t they find willing underwriters and investors? Because the bonds are inherently toxic. The garage bonds for CentrePointe carry huge risks, and investors are balking. The primary “showstopping” risk is that the bonds won’t begin to pay out until at least $150 million in new capital has been invested in CentrePointe. This is a requirement of the state statute governing the type of tax-increment financing (often called TIF) used for CentrePointe, and it means that investors wouldn’t receive any money until CentrePointe is almost complete. Understandably, investors aren’t thrilled with the prospect of waiting that long. That’s what makes this risk a showstopper: Developers want money from investors now, but investors have no guarantee that $150 million will ever be spent. Investors have no guarantee that they would get any of their money back. So potential investors are recoiling. And developer Dudley Webb admitted as much last week when he spoke before the Council. “We are so close. But also I want you to understand the difficulty in getting this thing to the closing table. “We have the prospects who will buy the bonds, and they want to be sure that the project is built, because there is a $150 million spend requirement that has to be done on that block before the TIF income comes. “So getting all six of these people, these lenders, to the table at the same time to close, along with the equity [i.e., bond] investors has been very difficult. Because the developers have pursued a piecemeal approach, with each of the project’s six components funded separately, they admit that they are unable to get their investors and lenders on the same page. The lenders for the buildings want assurance that the parking garage will be in place, while the garage bond investors want assurance that all of the buildings will be built. 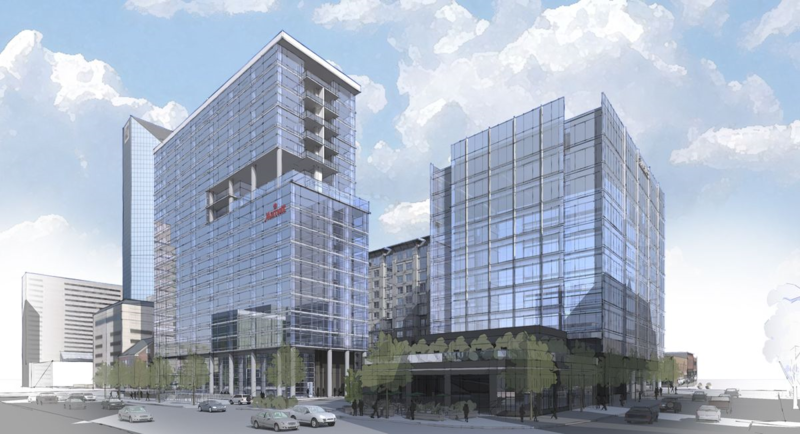 This “chicken-and-egg” standoff is unlikely to be resolved unless the developers can identify a single lender or investor willing to front all of the cash needed to complete development of CentrePointe. Then, perhaps, the bond investors would have enough confidence to purchase the garage bonds. And even if the developers found such an all-cash savior, the garage bonds wouldn’t begin to be paid off until CentrePointe was nearly complete – which further deters garage bond investors, who want to start getting paid back right away. Even if the developers can contrive a way to fully fund CentrePointe, there is another unavoidable risk for bond investors: The bonds can never pay for themselves (much less make any sort of profit). This means that any investor who buys garage bonds is practically guaranteed to lose about half of their money. CentrePointe’s bond scheme is as if I asked you for $100 today, and promised that I’d pay $50 back to you over the next 30 years. Interested? This is perhaps another reason the bond offering has been delayed. In order to sell the bonds, any bond offering statement would need to obscure the fact that the bonds would never pay off. And if they didn’t obscure that fact, then no sane investor would buy them. Together, these two risks for garage bond investors pose an insurmountable challenge to CentrePointe’s developers: They can’t get investors unless they complete the project first AND they can’t get investors if the investors realize that they’ll lose their money. And that’s the central reason that CentrePointe is in trouble: Once they are deprived of the ability to dupe investors, the developers are also deprived of the profit-making potential in the garage bond scheme. Even if the newly-minted mystery development partner is real, investors will remain rightfully wary of buying the garage bonds before CentrePointe is complete. Even if the mystery development partner fronts all of the money to complete CentrePointe, the development won’t generate enough taxes to pay bond investors back. Ever. So, even if the players change and even if CentrePointe gets built, the garage bond scheme is still a fraudulent scheme. And if the mystery partner can’t goose their profits with the garage bond scheme, then they probably won’t proceed with the project. The developers and their partners have sometimes characterized themselves as “doers” and their critics as “complainers” who cheer for the failure of CentrePointe. As long as what the developers are “doing” is attempting to defraud investors, it is the duty of critics to “complain” loudly and often. As much as I’d like to see something built in the gaping maw of CentrePointe in the very heart of our downtown, I don’t want to see it built with further fraud and deception. So unless the fundamental financial structure of CentrePointe changes, I am cheering for its failure. No apologies. FILL IN THE WHOLE !!!! Not to mention the interest rate risk that will befall the Bond holders. If interest rates go up, then the “sale” value of the Bonds will go down. Now who in their right mind would take on that type of investment? My guess would be that it would be the same group of people who initially believed in the “silent” Financier who mysteriously died. Well I can not believe that Joe and the Dud can not scrape together $30MIL. Heck I can come up with $30MIL to build a prefab underground garage. Must be some type of complicated engineering feat? What happened to finance plans A, B, C and BS?? Enter mystery financier number two without a will or checkbook.